Yachting Magazine is edited for both sail and power-boat owners. Each issue of Yachting Magazine features a calendar of boating events and reviews of new products including equipment, clothing and engines. Yachting Magazine is for both the experienced owners and prospective owners of recreational yachts. 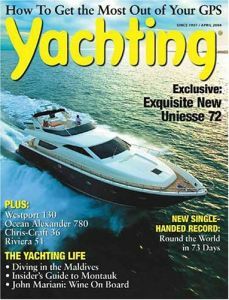 Yachting Magazine profiles yachts worldwide. Also covered by Yachting Magazine are destinations, day-trips, maintenance, design, electronics, and gear.